For Day FIVE of the Seven Day Art Challenge, I bring you a beautiful watercolor from C. Booth Farcus. SNOW GEESE, Maryland, 1992 by C. Booth Farcus (1914-1997) – Virginia Artist and Art Teacher I love the movement in this painting (through the arrangement, pattern, and direction of the geese). The energy glides us slightly to the right with the geese and the grass – and then settling into the bit of purple in the distant sky. I also love the rich turquoise in the middle and slight right – it pulls you in and leads the eye up to the bit of blue in the left-center geese and then the others in the sky, lifting the eyes in a slight zigzag – and then over and back around. I also love the dense teal because it is “velvet rich” and to see it in person you can feel depth. It is so rich that it almost feels like the paper cannot contain all that color – and it has to spurt it up. I guess this artist liked to add a touch of glycerin to the water and in some of our elementary watercolor classes, we had students drop pinches of salt on certain spots to create textures. If you want to work with watercolors this year, consider getting your hands on this watercolor calendar – you can look it up online – It is called “Watercolor 2017 Day-to-Day Calendar” by Dennis Pendleton (Andrews McMeel Publishing). I had one about ten years ago and LOVED it. This nice little calendar has art information, 150 lessons/tips, and includes the paint and paint brush. If you want to add a little bit of art to your life in 2017 – this is a win-win option. It also makes a really good “under 20 dollar” gift. It’s a gift not a given (for me anyway,lol). Lovely. I start worrying when this ends. Maybe you will continue, say once a week? Never heard of that calendar before. Seems like a great gift to me 😉 and to my daughter, my friends… Thanks. I did not do them everyday – but know that some folks do- because they need a bit of that in their office mode. but at the time i had mine – I had other crafty stuff going and wanted the calendars as a resource. I actually bought my first paint a day calendar at Five Below In January (close out) and used a few pages for middle school art. Make a three minute creation . Curious to see if you do it daily and then so see if you like it…. Bought 2: one for me, one for my daughter. I think it will be fun and will let you know if I do it daily (My feeling is probably not 😉 But I will look at each painting and read the tip for sure. Have you tried the watercolor pencils? I bought some but haven’t tried them yet. 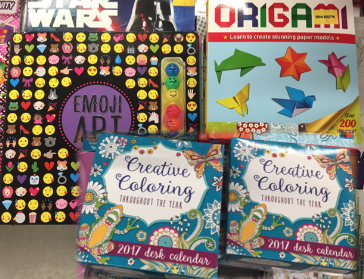 Hurray – how cool you bought some – and in between my son’s game tonight I had to run to Trader Joe’s and went into he Five Below next to it – they had “color a day” calendars – but none of the paint a day ones – I took a pic to show you. With our sheets we had students try and draw some – so on a few of your days I suggest you get some extra blank paper and sketch your version- or copy it directly – people minimize copy work – but sometimes it gives the hand focus and helps us feel the lines in a price. Cool! Great tip, Yvette! Thank you!!! What do you mean about my continuing ? Do you mean art or posting in general? Oh – I see what u mean….. and hm…. I am thinking of a fresh idea for blogging in 2017 – so let me add that to my brainstorm list…. December 11, 2016 at ..